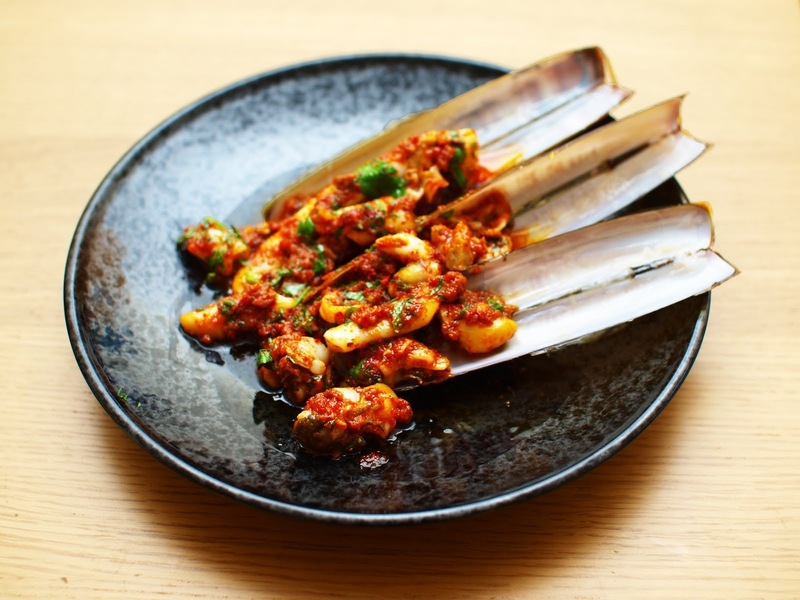 Razor clams. Musings and some recipes. I was thinking the other day that I don’t eat enough razor clams. They’re plentiful, cheap and delicious. So to address that I bought a kilo of them and scoffed them all on my own! 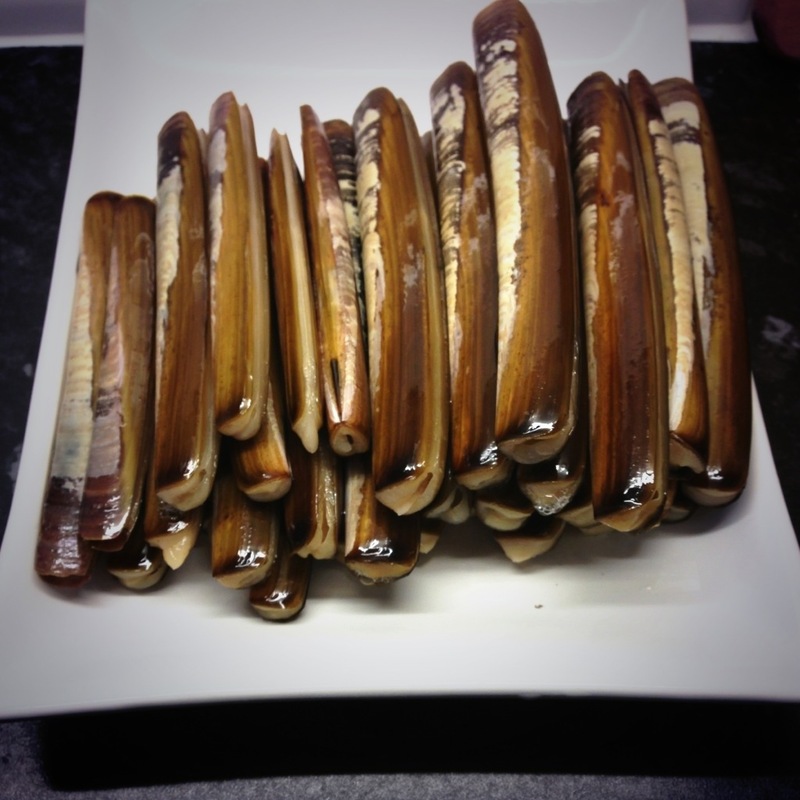 Almost 30 of the buggers for £8, I was in razor clam heaven for an evening. They don’t take much to prepare either, the six dishes that I tried out only took a couple of hours from start to finish. Seafood is fast food. The first two dishes require no cooking at all. There is an adage that you should do as little as possible to fresh seafood. All seafood loving cooks know this. So what’s simpler than just eating raw clams? But first you have to clean them, razor clams notoriously can be full of sand. Shuck one open and see how much grit you have in there. It will wriggle a little, you’ll see the main fleshy muscle ‘foot’ where most of the sweet meat is surrounded by the stringy abductor muscles that keep the clam shut. At the top is the siphon, at the centre there’s the digestive tract where half-digested food and most of the sand will be hiding. Check this part carefully with your fingers. If it feels soft then you’ve got a clean batch. If not then soak your clams in cold water for an hour, this will help degrit them. Luckily I bought a clean batch this time so I was ready to go! Shuck open half a dozen clams, take out the prime fleshy muscle ‘foot’ only, butterfly them open, scrape along them to make them curl up like ferns. Dress them with sea salt, lemon, caper, shallot, parsley and olive oil. Eat. 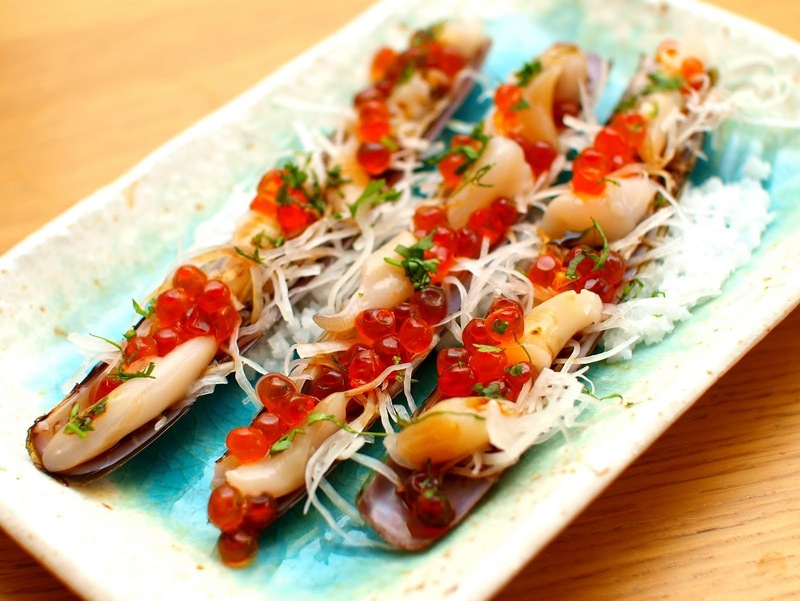 Moving away from the Mediterranean, I hear that the Japanese like to eat raw seafood too. Again using only the fleshy foot, slice it on the bias and return the pieces to the shell on top of finely shredded daikon. Dress with salmon roe, ponzu and very fine Thai basil (I couldn’t get hold of shiso). There are two classic variations we have in the Cantonese repertoire; Black Bean Sauce and Ginger Spring Onion. Prepare the clams first by opening them and loosening them from the shell. When cooked most of the clam is good eating, even the half-digested stuff in the sac. 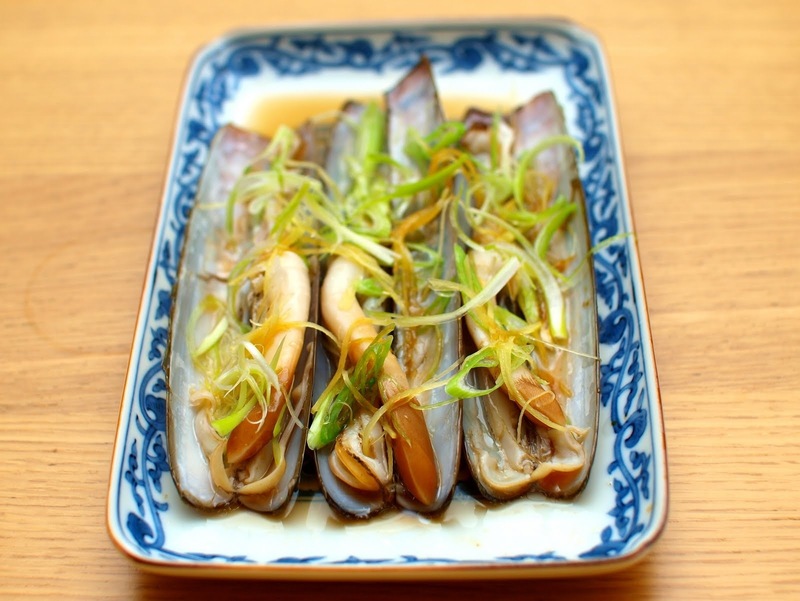 Traditionally the black bean version is stir-fried because the razor clams you get in Asia are quite small. 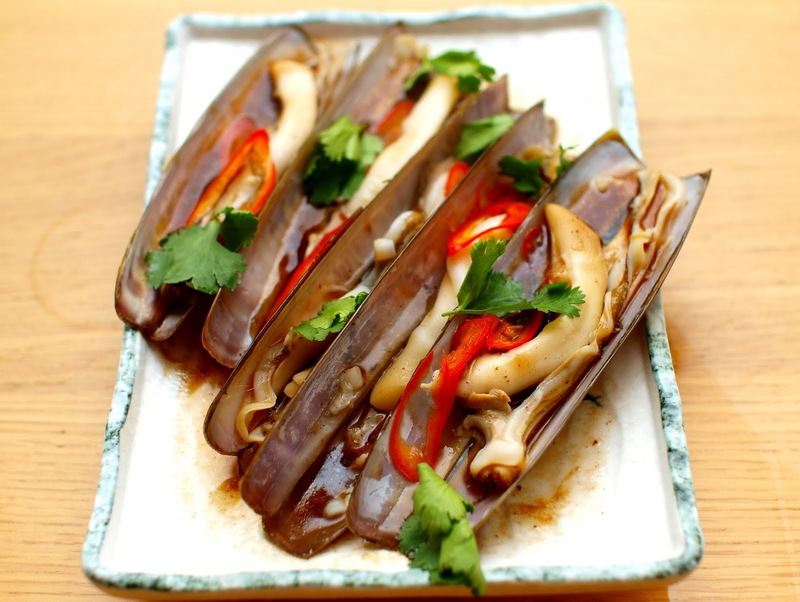 But with bigger clams I like to make an extra rich black bean sauce separately and dress the raw opened clams with this sauce, mild red chillies and steamed for two minutes. The sauce is made by frying garlic, ginger, spring onion and crushed fermented black beans together till aromatic. Add a splash of shaosing then stock, chicken preferably but instant dashi is a good for convenience, simmer for 5 minutes. Season with sugar and soy then thicken with starch. Strain the sauce before using it. Even simpler is the ginger and spring onion variation. Dress the raw clams with this finely shredded stuff, add salt then steam for two minutes. Add a splash of soy to the clams before sizzling with smoking hot groundnut oil. Finish with some fresh curls of spring onion. Nick was raving about this dish he had at the Quality Chop House in London. Sounded simple enough but I couldn’t quite get my head round the taste combination. So like foodie monkey sees he does… Deep fry the shallot first and season them with a little salt. In a searing hot pan or hotplate place your clams so they open downwards, add a little olive oil, a splash of lemon and clamp a lid on for one minute. 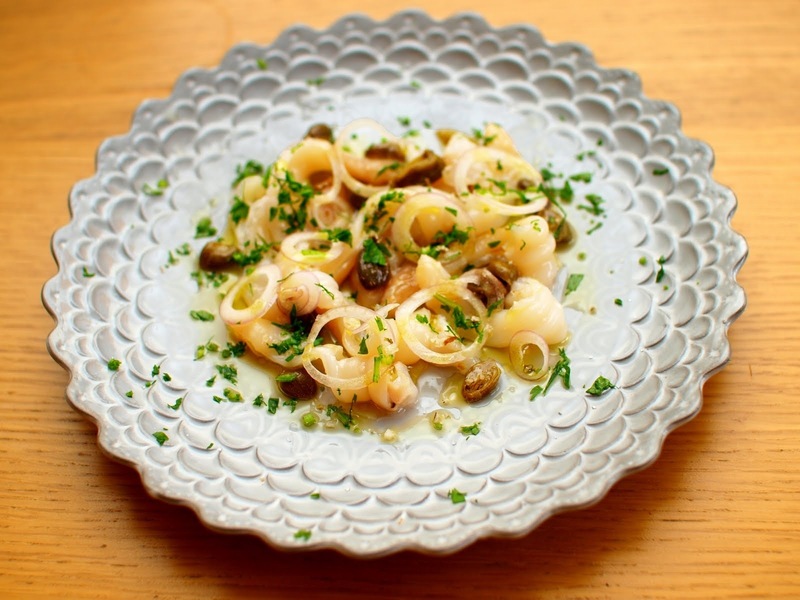 Remove the clams right away, slice them and return to the shell, dress with the shallots and a drizzle of the best sherry vinegar you can afford. Any doubts I had about this dish were dismissed with the first bite, it’s a taste sensation. Try it now, I dare say this combination of crispy fried shallot and sherry vinegar would work with a lot of things. I’ve been curing my own n’duja, as you do, that spreadable spicy Calabrian salami. Except I couldn’t find any Calabrian pepper powder so I used the reddest chilli powder I could think of, Korean Gojugaru. The addition of the fish sauce has seen it renamed Kim Doo Ya! But the essence of deep spicy funky pork fat is still there. Shell your clams first and slice them into chunks. Start frying off the n’duja in a pan, it should melt into a crimson slurry of pork fat, cook it out a little then add garlic and then the clam meat. Cook for one minute, at the end season with lemon juice and smack it with parsley*. That’s it, serve them back in the shell or just as it is with some bread to mop up all those juices. I think frying some breadcrumbs till crispy in the n’duja first would be a good variation, will try it next time but as it stands clams with n’duja is pretty good eating. Pork and clams eh? 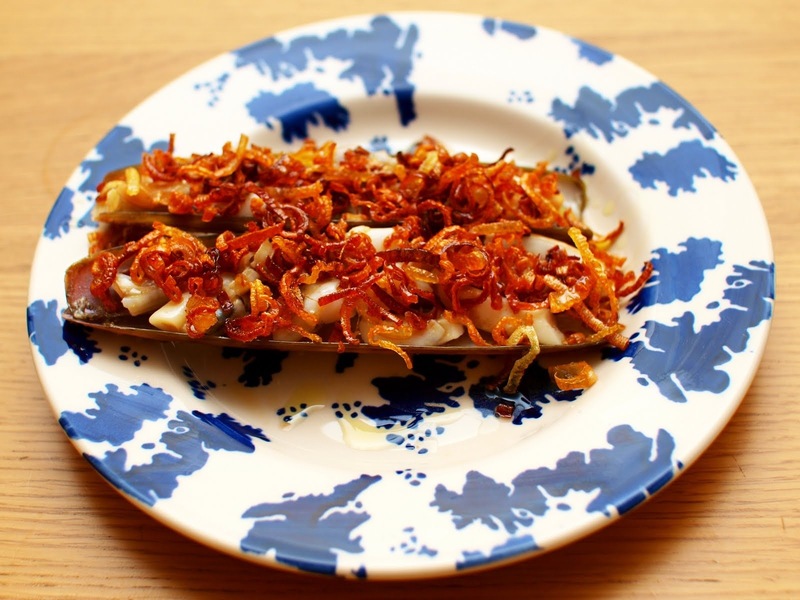 Hopefully you can see that preparing and cooking Razor Clams is actually really simple. Try out these dishes and let me know which is your favourite. I know which are mine. * yeah I said it. We pull buckets full of Razors out of the sand flats in Cape Cod. I’ve been hunting for recipes for years (up to now we’ve been deep frying and making fritters) These are wonderful and I can’t wait to try them all, one bivalve at a time. Thanks for posting.